The use of controlled explosives is vital in mines but can be deadly if they are handled wrongly. If miners do not make accurate measurements or choose the right spots to place explosives, rocks can fracture in unexpected ways, creating a hazardous situation both underground and above the surface. So imagine being able to practise this risky art without the inherent dangers, in a simulated, virtual reality mine. 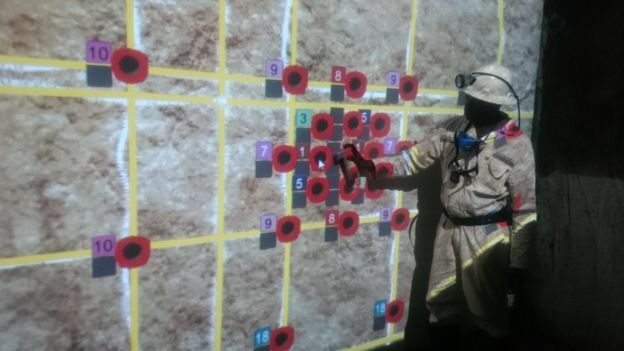 The world’s first VR blast wall was developed by South African company Simulated Training Solutions (STS3D), and installed at Glencore’s Mopani Copper Mines in Zambia in 2016. Since then, two more walls have been installed in South Africa, with a third currently under construction. In a darkened training room, the image of a rock face is projected onto a life-size interactive canvas. Trainees use an electronic “spray can” to mark out their measured blast holes, practise detonating explosives in the right sequence, and watch how the rocks fracture and react. Their mistakes are highlighted over their markings. Johan Bouwer, head of VR and new technology at STS3D, says the walls are one of the “closest representations of on-the-job training for miners” and are more effective than typical training methods, such as videos and blackboard exercises. Better trained blasters also mean cost savings for mine operators, he says. In precious metal mines, a blast gone wrong can delay production and result in clean-up and labour costs. It is not just VR that has caught the eye of mining companies – a host of other technologies are changing the way mines operate day-to-day. 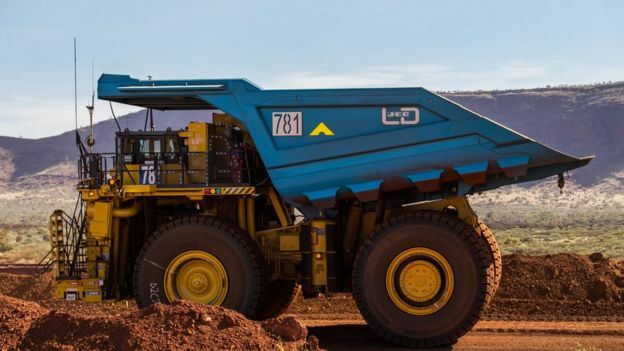 Global miner Rio Tinto is busy implementing innovations across its operations worldwide, particularly at its sites in Australia, where autonomous drills and trucks, as well as drones are already in use. The company is also due to launch the world’s first fully autonomous heavy haul train by the end of the year. 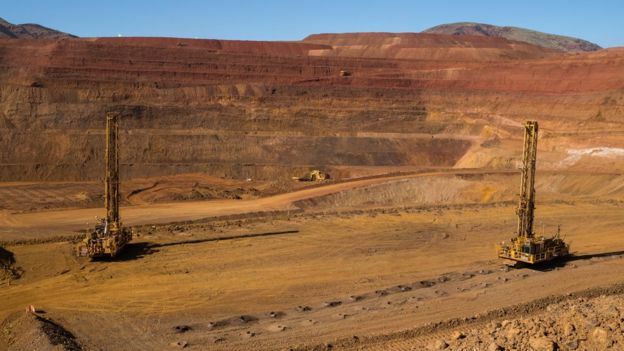 The benefits of these new technologies are substantial both from a safety and productivity perspective, says Stephen McIntosh, head of growth and innovation at Rio Tinto. Drones have a variety of applications, including evaluating terrain, inspecting equipment and filming blasts. Generally, they provide quick and safe access to aspects of operations that are at heights or in hard-to-reach places. Autonomous drills and trucks have improved on-site safety, as well as productivity. Now one operator can take charge of multiple drills concurrently. The autonomous system also generates high quality drilling data which can be used to achieve better blasts and estimate the size of a ore seam. “We’re removing people from the line of fire, reducing our people’s exposure to hazards and risks associated with operating heavy equipment, such as fatigue-related injuries and also sprains, strains and other soft tissue injuries,” Mr McIntosh says. Going beyond safety and productivity, there is hope that emerging technologies could also help to address social and environmental issues facing the mining industry. Efforts have recently been stepped up to reduce the prevalence of children mining cobalt – a metal used in the lithium-ion batteries found in smartphones and cars. Over half of the world’s cobalt comes from the Democratic Republic of Congo (DRC), where Unicef estimates more than 40,000 children work mining the mineral. The Responsible Cobalt Initiative (RCI) was set up in 2016 by the Chinese Chamber of Commerce of Metals, Minerals and Chemicals, and currently has 32 members such as metal refiners, battery makers, and electronics and car brands – include brands like Apple, Sony, Daimler and Volvo. Among other measures, it is investigating how blockchain could be used to improve the traceability of cobalt throughout the supply chain to ensure it does not come from unethical sources. These solutions are inspired by blockchain’s independent, ledger-style system of logging transactions between parties, which creates a digital paper trail that cannot be altered. However, Ms Feng says it is still “hard to say” whether blockchain will have a defining role in improving the cobalt industry anytime soon. With so many new technologies being deployed, some may wonder if workers in the mining sector will soon start to be be displaced. However, RCI says all the solutions it has come across so far still require a trained team to collect data and provide valid inputs. 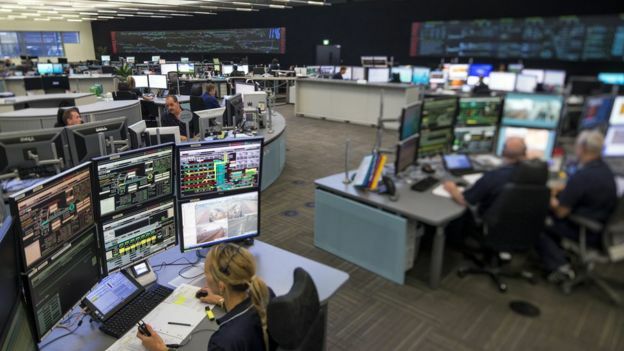 Rio Tinto adds that people will “always” be needed in technical and operational roles at the firm – although it continues to work on new ways of incorporating technology into its business. Previous Article Is the killing boom the key to supersonic air travel? Next Article E-waste mining may be a major business!